Punjab University Lahore Jobs 2018 download Application Form Last Date to apply for the current PU Jobs december 2018 in Lahore official website www.pu.edu.pk for the Punjab Domiciled Male & Female both apply. 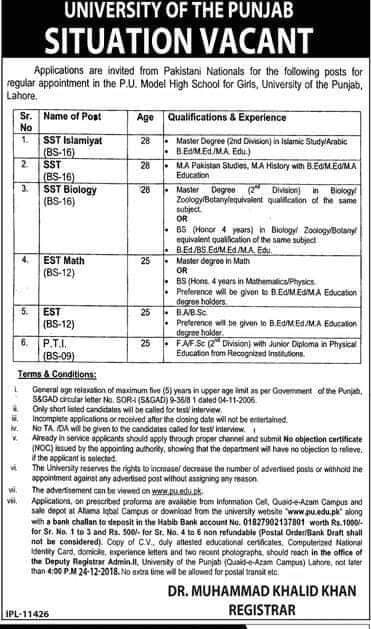 How To Apply for Punjab University Jobs december 2018? 2)Fill the application form along with CV, attested educational certificates, ID Card, domicile, experience letters and two recent photographs should reach the office of the Deputy Registrar Admin. II, University of Punjab (Quaid-e-Azam Campus) Lahore. 3) All Candidates have to attach with the application a paid Bank Challan of Rs. 1000 for Sr. No. 1 to 3 and Rs. 500/- for Sr. No. 4 to 6 in favor of Punjab University.